Our dog is a seadog. Published last year in 2013, this beautifully illustrated book is an ode to a beach-loving, wave-chasing, “find-and-roll-in-fish” dog. 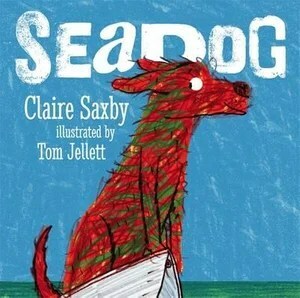 A quick google reveals that Claire Saxby writes poetry as well as books, which makes sense because although it does have a sniff of a narrative Seadog reads like a poem, and is full of delicious nuggets of language. Seadog is a “run-and-scatter-gulls” dog, a “jump-and-chase-the-waves” dog. He isn’t a “sit-still-then-roll-over” dog. Those adjectival phrases will have Early Years teachers reaching for their literacy planners faster than Seadog can spook a gull. The main message of this is of course accepting people as they are and celebrating the individual. Sure he is scruffy and dirty and smelly, and he won’t bring back a stick, or do as he’s told, but Seadog is very much loved by his owners. And his irrepressible joi de vivre is reflected in Tom Jellett’s vibrant illustrations. Like Seadog himself, this book reeks of personality. It’s funny, touching and well-written and could be enjoyed on different levels by children of different ages. A five-star find.